Use the Secondary click check box to enable multiple mouse buttons. The Mac OS has included support for multi-button mice since 1997. However, Apple didn't make a multi-button mouse until it released one in the summer of 2005, Mac and Windows users alike didn't know that the Mac could use a mouse with more than one button. For years, the default setting in the System Preferences was for multi-button mice to have all buttons assigned to the same primary click function. This caused any mouse connected to the Mac to mimic the original single-button mouse that was included with the first release of the Macintosh. OS X and macOS fully support mice of any style. 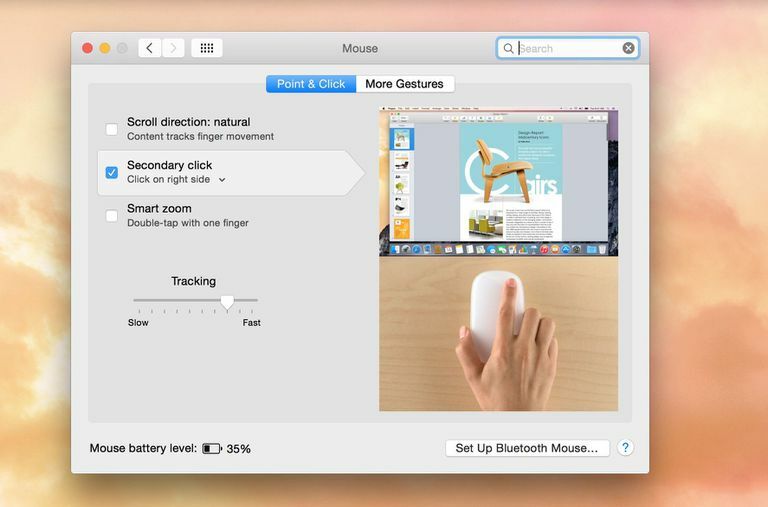 You can easily enable multi-button support, as well as support for gestures, assuming you have a mouse that supports gestures. If you're using a third-party mouse that includes its own Mac mouse drivers or preference pane, you should follow the instructions provided by the manufacturer. There have been many versions of the Mac OS, but the process for configuring the mouse has remained consistent. The Apple Magic Mouse requires OS X 10.6.2 or later, while the Magic Mouse 2 needs OS X El Capitan or later to work correctly with a Mac. Other gesture-based mice may require specific minimum versions of the Mac OS, so check your mouse's system requirements before continuing. Launch System Preferences by clicking on the System Preferences icon in the Dock or by selecting the System Preferences item under the Apple menu. In the System Preferences window that opens, select the Mouse icon to open the Mouse preference pane. Choose the Point & Click tab. Place a check in the Secondary click box. Use the drop-down menu just below the Secondary Click text to select the side of the mouse surface that you want to use for the secondary click (right side or left side). Close System Preferences to save the change. Launch System Preferences by clicking on the System Preferences icon in the Dock, or by selecting the System Preferences item under the Apple menu. In the System Preferences window, click the Keyboard & Mouse icon or the Mouse icon preference pane, depending on which version of the Mac operating system you're using, to open the preference pane. Click the Mouse to see a pictorial representation of your Mighty Mouse. Each button on the Mighty Mouse has a drop-down menu that you can use to assign its function. The default configuration has both the left button and the right button assigned to Primary Click. Use the drop-down menu associated with the button you want to change and select Secondary Click. Launch System Preferences by clicking its Dock icon or selecting the System Preferences item from the Apple menu. In the System Preferences window, click the Keyboard & Mouse or the Mouse icon to open the preference pane, depending on which version of OS X you're using. If needed, click the Mouse tab. Assign the Primary Click mouse button to either the left or right mouse button. After you make your selection, the secondary click function is assigned to the remaining mouse button. If you use a single-button mouse or you don't feel like clicking the secondary mouse button, you can press and hold the Control key on the keyboard while clicking the mouse on an item to create the equivalent of a secondary click. Wish You Had a Bigger Mouse Pointer?